Chapelwood is a 55+ neighborhood with an appealing streetscape that is located in the master-planned community of Downing Creek in Chapel Hill, North Carolina. Hagood Homes developed these residences with green building techniques and utilizes the EPA's Energy Star for New Homes Programs. Surrounded by the wooded and pastoral property of the UNC Alumni-Faculty-Staff Recreation Association (also known as The Farm), Chapelwood has a natural ambiance. The community further enhances this atmosphere by keeping 30 percent of its land undeveloped. With only 69 single-family homes, this serene community will also keep its intimate appeal. Chapelwood in Chapel Hill has a clubhouse that provides residents a place for social gatherings and activities. It includes tennis courts and an outdoor pool. Serene walking trails wind throughout the surroundings to allow residents to experience nature up close. Sidewalks connect residents with the pool, tennis courts and with the trails that lead to the adjacent community of Downing Creek. The Finley Golf Course is only a few minutes away and offers 18 holes of scenic and challenging play. 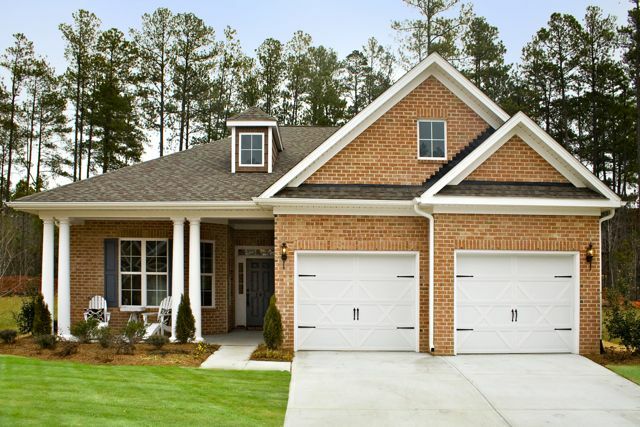 The one-level homes at Chapelwood in Chapel Hill feature all-brick exteriors and impressive three bedroom floor plans ranging from 1,773 to 2,710 square feet. All Chapelwood homes include over-sized two-car garages, two or more baths, spacious living areas, Carolina sunrooms, and covered porches. There are five models available, and they all have optional bonus spaces over the garages which would add between 350 and 360 square feet of living space.In addition to green building features and energy efficient elements, all homes at Chapelwood include granite kitchen counter tops, maple kitchen cabinetry, wood and tile floors, designer trim and molding throughout, and vented gas-burning fireplaces. Plenty of customization options are available to new buyers who want to accentuate their furnishings and individual lifestyle. Sodded lawns, irrigation systems, and lawn maintenance are included for all homeowners. ​Chapelwood at Downing Creek offers a relaxing lifestyle in a charming 55 and over neighborhood, surrounded by an effervescent community. Home values are excellent for this outstanding location and taxes are low. Moving into Chapelwood is a pleasurable experience and neighbors of this tight-knit community extend a warm welcome to newcomers. On-site outdoor activities include tennis, and there are many opportunities for fine dining and entertainment in the immediate area. Located just off Highway 54, across from Meadowmont, Chapelwood is in a highly desirable location just minutes away from the University of North Carolina (UNC) campus and lively downtown Chapel Hill. Chapel Hill offers many shopping options and numerous points of interests. These attractions include the Morehead Planetarium, the North Carolina Botanical Garden, the Preserve at Jordan Lake, the Ackland Art Museum, the Oakland Historic District, the Coker Arboretum, the Chapel Hill Museum, and the Horace Williams House. Residents have easy access to the prestigious medical centers of UNC as well as Duke University. In addition, UNC offers a variety of attractions as well as continued education opportunities and classes. Chapel Hill is also close to Eno River State Park, Falls Lake State Recreation Area, and William B. Umstead State Park. Chapelwood is only about 20 minutes away from Durham and 40 minutes from Raleigh for additional entertainment and recreation options.